Labrador Retrievers are of the most intelligent breeds, according to the controversial book The Intelligence of Dogs by Stanley Coren. Nearly 208 judges from the American Kennel Club and Canadian Kennel Clubs assessed all breeds and understood each had different abilities in trainability in intelligence as well as the time and proper trainer to help learn. The dogs that rank in the top 10 are the brightest in working intelligence and obedience. Plus, many have outstanding temperaments. Highly intelligent dogs can pick up most tasks within five repetitions and can remember them. They also listen to their handler most of the time and respond in a timely manner. Labradors had to be intelligent because they were once used in the icy waters of Newfoundland in the 1880s to haul in nets for fishermen, connect boats, bring in ropes, and help hunters get downed birds. 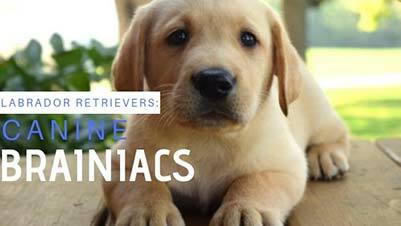 Labrador Retrievers were bred to be the perfect versatile, rugged, all around water dogs. Not only are they intelligent, they were bred to have a thick coat for the icy waters, webbed feet to paddle through and a thick, rudder like tail to propel and steer through the water. These dogs were originally bred to be sturdy, with an excellent nose, and a love of water, wrapped up in a medium sized body. Today males weigh up to 80 pounds and stand 22.4 at the withers; females reach up to 70 pounds and stand 23.5 inches tall. To this day these dogs excel in dock jumping and the largest recorded jump was 30 ft. 7 inches by a lab named Storie. In order of rank and breed based on working intelligence and obedience the Border Collie, Poodle, German Shepherd, Doberman Pinscher and Shetland Sheepdog rank in the top six spots. The Labrador ranks in at number 7 followed up by the Papillion, Rottweiler, and Australian Cattle Dog. Labs have been America’s favorite dog for the past 27 years. These dogs will do anything they can to please you. Many people love that they’re loyal, friendly, and make fantastic family dog. Of course, they’re natural at retrieving, and love car rides, the beach, snow, and playing with children and other animals. Long walks are one of their favorite pastimes. However, there is a common nuance about some Labradors that many don't know. Strictly speaking, the three most common colors for Labradors include Yellow Labs, Black labs and Brown Labs which are sometimes called Liver or Chocolate. The U.K Kennel Club only recognizes three colors. Labrador retrievers also come in a wide range of yellow coats; it’s challenging to predict the ultimate color from a newborn coat. The multiple shades of yellow come across in different intensities, uniformities and colors and will grow lighter as the dog matures. Some labs are pale white; others look like a dark red fox. Some people believe Red fox Labradors come from Yellow Labradors. This isn’t true. 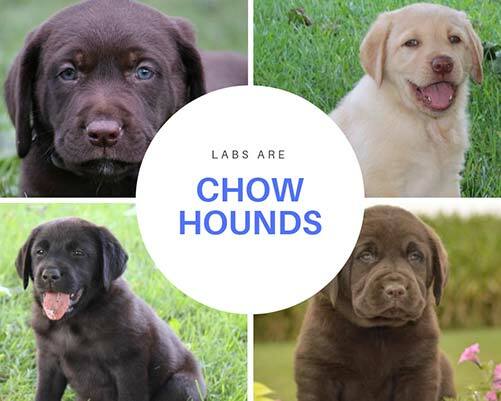 It is not uncommon for Labrador puppies from the exact same little to have totally different fur colorings and there is no guarantee that puppies will be the same colors as their parents. 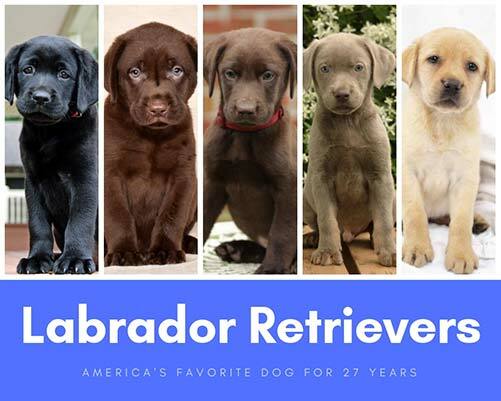 So how is it possible to tell what color Labrador you may end up getting? Black colored labs occur because the color black is a dominant gene, making this the most common colored Labrador in the world. Brown and chocolate colors are recessive genes. Even if there is a recessive trait of brown and chocolate the lab will still be black because black is the dominant trait. Chocolate Labradors would need two recessive traits to have a rich brown coloring instead of black. Yellow Labs have a dominant masking gene that will allow the yellow to shine through. Yellow labs sometimes called fawn labs and these puppies come in a darker color than traditional yellow. It’s interesting to note that you can get all three colors by mating two black dogs and it’s also possible to mate a Yellow and Chocolate lab to get six different variations of colors including: all the puppies are chocolate, there are some yellow ones and chocolates ones, all three colors are present or only yellow and black puppies are present. Then silver labs have a gene that dilutes the color of the fur leading to a soft looking or silver black (which seems to be a trend in Labrador breeding) or a yellow lab that looks like the color of champagne. Regardless of the color of the dog, each will require brushing because they expel a great deal of hair. Why are these dogs so popular? In 2003, the American Kennel Club discovered that there are three times as many labs as there are Golden Retrievers. Many believe this is since labs are so versatile plus they have an easy-going, happy personality. People love kind, outdoing dogs who want to be friendly companions and hard workers. Historically Black Labradors have long been favored for their agility and ability to work well as a gun dog. Chocolate labs are believed family pets and have been hunters and working the show ring for a long time. Not only do Labrador Retrievers come in a coat of many colors, they also have webbed feet much like all dogs which helps them push their way through the water. Each’s dogs’ coat is covered in a slightly oily substance which keeps them warm and dry and many people love a wash-and-wear dog. But feet and color aren’t the only traits you’ll notice about labs. They’re food hounds; foragers, and they never forget exactly where you last dropped a crumb. They have been known to drool beg their owners are eating and give sad puppy dog eyes. According to Science News, University of Cambridge researchers believe that they may have found a gene called a POMC that’s missing from fatter labs. This gene plays a role in metabolism and may regulate hunger. These dogs are most willing to please when there is an opportune treat around. Many Labradors have been known to come across no-no food and will inhale as much as possible before they can be stopped. These pups can pack it on quickly. This may be quite helpful in training. You can get a Labrador’s attention quickly with food and treats. They are highly motivated to learn new skills and then these puppies take their love of food to next level. Using food as a positive reinforcement, these dogs have been known to sniff out cancer in humans. As with all dogs, all owners should be careful to balance food with exercise. It is important to keep weight to a healthy level, make sure the Lab goes to the vet. Find a good daily workout doe the dog. He’ll love running, playing, walking or letting him run in a fenced in yard. They’re great biking and jogging partners and love to burn energy. When these dogs aren’t playing they love to work. When people look at dog their physiology changes. Their pupils dilate, their blood pressure returns to normal, and cortisol levels drop. Why? People are bonded to animals. The animal bond helps people in emotional, psychological and physical distress and it’s been shown that lower stress, anxiety and the perception of pain. Dogs help people heal and there are various groups that use dogs to do just that. They’re called therapy dogs and these pups, and their handlers have undergone extensive courses to be able to serve all types of populations from hospitals settings to nursing homes. They visit cancer patients, spend time with first responders, and with kids with autism. Therapy dogs are not service dogs. They serve in the community. Service dogs make it easier for people with disabilities to work and live where they currently are in life. Labradors have been used in search and rescue, aided in hurricanes and even helped with Group Zero. The dogs love it because it gives them a sense of purpose and they have the innate characteristics to help with the tasks at hand. Not only do they help people, they help Cheetahs, too. A Labrador recently made friends with a Cheetah at the Columbus Zoo in Ohio. This $40 million-dollar facility often hears time and time again, “When are the labs coming out?” These Labradors share their exhibit with Cheetahs. The Labrador named Carlyle, was placed with the Cheetahs when he was a pup and they were cubs. Over time, Carlyle and Edward the Cheetah became friends. These friends will live their life together and will become less skittish and more confident animals over time because of their bond. The dog provides the Cheetah comfort; their relationship is akin to a cat and a dog. Only this dog hangs out with the Cheetah and provides comfort even after surgeries. Wondering if a Labrador Retriever is right for you?